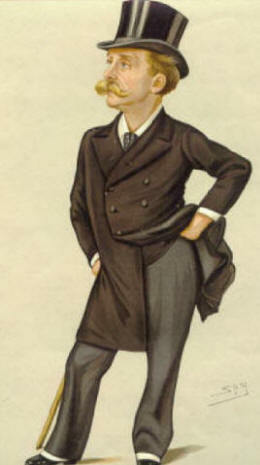 Thomas Gibson Bowles, pictured in one of several caricatures of him by Spy, originally published in Bowles's own paper, Vanity Fair, on 13 July 1889, seven years after he became a Director of the London & Provincial Turkish Bath Company Limited. The title of the plate is 'Tommy', the name by which he was usually known. He was the maternal grandfather of the Mitford sisters. With the death of Urquhart, standards at The Hammam declined. Bowles, a regular bather, bought himself a single share, had himself elected to the Board, and then took it upon himself to become a one-man ginger group. This was unfair, and a rather jaundiced view from one of the directors who clearly resented such criticism. Bowles may have lacked modesty but his criticism was positive and he did, very effectively, remind the somewhat complacent board of directors of their responsibilities. Sexual activities in the Jermyn Street Hammam. 4: Perhaps after all?